It all started more than one year ago. 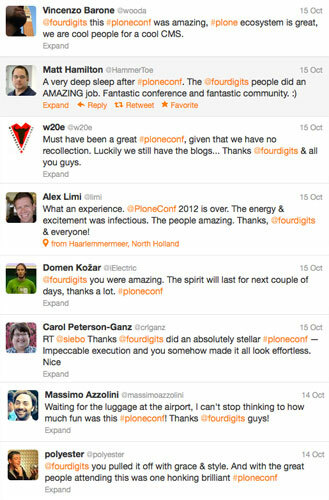 On October 12th 2011 the first steps where taken to host the next annual Plone Conf. We started to look for possible locations. We were looking for a venue that would have about four main rooms for talks and trainings, one hangout and a sprint location. All available for seven consecutive days. We went to Musis Sacrum. Musis turned out to be a promising candidate. When we went there it became obvious we wanted this venue. On October 21st we received an acknowledgement from the venue. They could meet our demands! There were numerous excellent proposal examples and blog posts to get started and in about five weeks time the proposal was written, rewritten and styled. We had to think of “Team”, “Venue”, “Arnhem” and "Marketing”. We styled the proposal to make it look better. For more information check the proposal. On January 12th 2012 we won the bid! Time to organize the event! Here is a wrap-up for everything done by the Four Digits team! There were 250 people visiting the conference from all over the world. We don’t want to know the exact hours 😃 raw estimations: 1750+ hours. There were 12 people from the Four Digits organization working fulltime during the conference days. On February 12th we released the conference logo. Rita Vargas Kiss from RebelX did a remarkable job designing the logo, badges, flyers, posters, plone-awards and the website. On February 21st the website went live and was filled with all the information we thought was important. We put up a list of hotels, venue information, and opened registration. We called all hotels in Arnhem to make special arrangement with them. They were not that happy to do so, as they were hoping for more concerts in the Gelredome so they could raise their prices (yes they do). Luckily for us only on saturday an extra concert was annouced, so Arnhem was not filled with an extra 30.000 people who would go to the football-stadium during the conference days. Putting the website online very fast was a wise choice, we could easily change and update information on the website when we got questions. This venue was the best choice we could make. It is located near the city center, is easy to reach, and was beautiful from the inside and outside. The floorplan was a little hard to understand for some people (“Where is the heaven hall and balcony hall? !”), but the hangout worked out great. The two main halls were easily capable of hosting all of you. 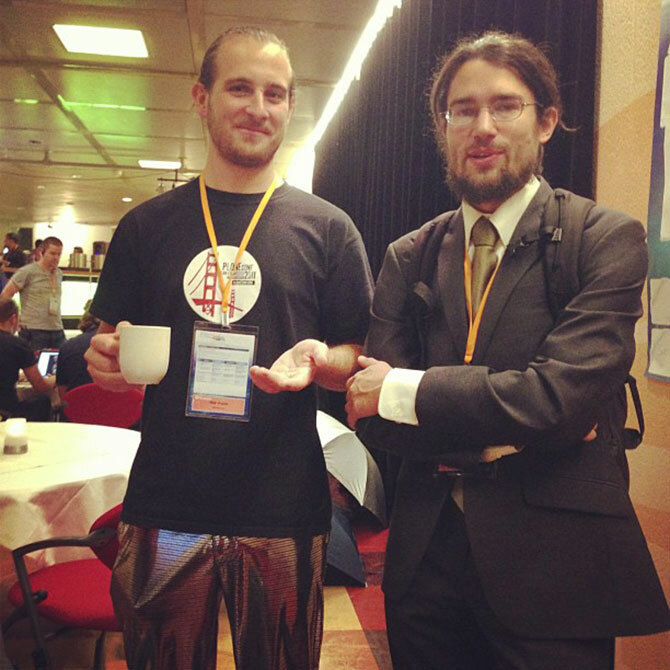 PloneConf: disco pants or three piece suit? As there was no fiber connection in the conference venue we sponsored € 2000 to have a fiber connection that would be reliable for the conference. Musis already had plans to get a fiber connection before we wanted to organize the conference. Unfortunately they are officially a government organization and as such they are on the government network. Their policy is to block everyone that is using internet for social media or other non-work related internet use. So we didn’t even want to try running a buildout there. The fiber connection was established in September and we had full access and unlimited bandwidth. The wifi was done by Wyn Williams. He did an amazing job, there were no major problems and we covered the whole venue using only 12 access points. Video was done by HD Video Productions. They were fast, flexible and able to stream and tape all video’s during the conference. We are converting them as we speak and they will be online ASAP (yes really, they will be online ASAP). We have over 700GB on raw video data! It seemed so simple, you get yourself a payment system and everything will work itself out. Unfortunately that was not completely true for us. We had several kinds of problems with several kinds of systems. Especially when the earlybird ticket expired and we went on to selling tickets for normal price. We had to handle with requests for tickets by mail for some time. It was hard to keep track of all the information people provided us and we were afraid that people would give up on buying a ticket or run into other kinds of problems. We advice the next conference organization to be sure to have a backup plan in case they run into these kinds of problems as well. No conference without a Mobile app. We investigated several applications and we chose Guidebook. It was quite a bit of work to add all talks and speakers but in the end it was used by most of you. 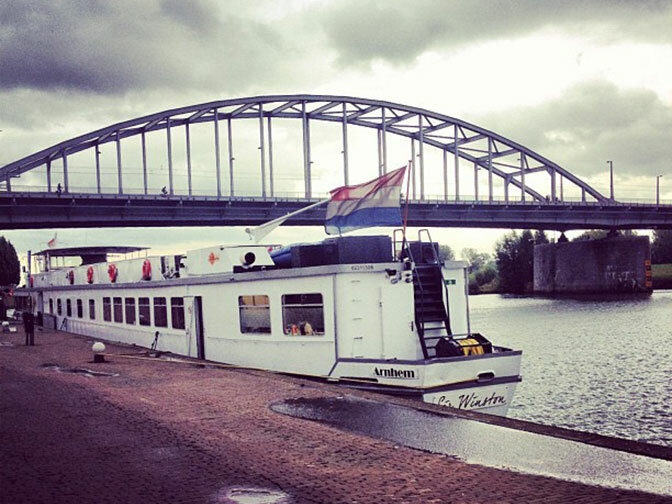 We had plans to have a floating hotel in the river Rhine since the beginning of the conference preparations. For the first time in Plone Conf history there was a floating hotel for Plone People only and turned out great. There were some great parties at the boat, not limited to but including a “pants-swapping party”! We met the budget, including a fee to the Plone Foundation. We are still waiting for the final bill for the venue but all should be well in the end. The sponsors played the most important role for the budget, we needed 220 people to break even. Four weeks before the conference we were having troubles getting to that point as only 194 people bought a ticket. In the last weeks there was a rush on tickets and with 250 sold tickets and so many sponsors we were able to improve on some of of the aspects of the conference. Did we tell you about the 250+ badges printed out which had to dry for several hours? The whole office was turned into a badge printing factory. We had Bronze, Silver, Gold, Supporting, Speaker, Organizer, and Normal badges everywhere. Even more fun: we had to print both sides… After printing we filled the 250 bags, ordered them by last name, and divided them over 8 lines at the conference entrance. On October 8th Plone Conf 2012 started with training sessions at both Musis and our office. 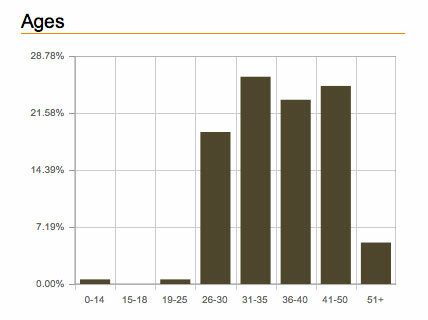 Over 50 people were doing a Plone related course! 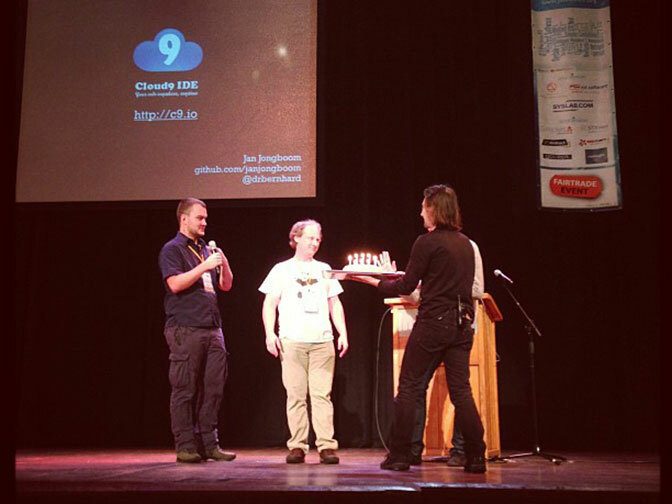 The Dutch Users Day was on Monday as well. The users-day was organized by eight Dutch Plone companies and had 40 visitors. This was a great test for the wifi and for us to see how people were finding their ways during lunch, breaks, and the sessions themselves. The equipment in the rooms where the talks would be was working fine and everything was running smoothly. Only problem was directions in the building, people were looking around to find heaven and balcony hall. We printed over 100 direction signs during the conference days. The conference is a GO! On Wednesday October 10th the conference started with a blast, 250 people coming in at once. There were 9 lines for getting your badge, some people were having troubles as about 10 goodiebags seemed to have gone up into thin air the night before… There was a concert that night. So maybe somebody mistakenly put them away or something. The line at the information desk for people who somehow could not receive their goodiebag had lots of work to do like printing new badges and printing extra signs. People found their way to the balcony of the concert hall within three minutes after the first people had entered and access to that balcony was prohibited, but hey it was open! Talks started and the 4D team came to a rest. The conference was happening and everyone was full of energy and glad everything was working out fine. The internet was holding out great and the video streams started. Updates on twitter and blogs were going at full speed. In all the rooms there was a floormanager from the organization, having a walkytalky to communicate with the rest of the organization who were helping and doing all kinds of things in the background. That way it was easy to request help on beamers, streaming, wifi, water, etc etc. In the hangout the information desk was handling all kind of questions and the lost & found. On Thursday somehow all(!) of the conference signs had been removed. We had to put them back on before everything started again at 9. Friday we had a better start, people where coming in slowly as the nights were short for the most of you. We truly enjoyed these days, the organization-team was having a blast. We did a standup after each day to review anything we could do better for the next day and finished as a team with a little drink at a local bar. They were absolutely amazing, we managed to handle 8 on Wednesday, 17(!) on Thursday and 14 on Friday. Everyday the room was packed and we saw some amazing stuff. After 3 days of conference we all deserved a big dinner and party. During dinner there was a mixup with the venue organization who instructed the waiters you had to pay for your drinks (sorry for that), but this was corrected pretty quick. The party was hosted by Kamara and they played some groovy tunes until 2 in the morning. The party continued at our office and the last person left at 6.30. 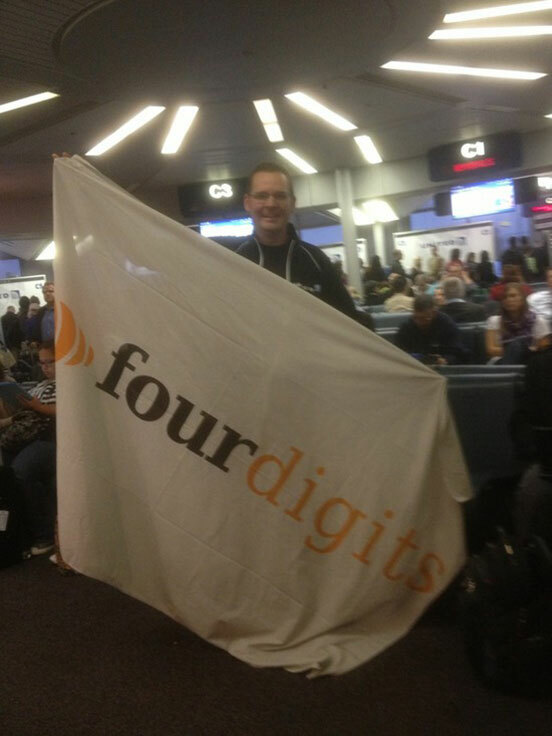 We heard stories about people playing tennis at Jans Binnensingel and the Four Digits flag is now crossing the world. Will we ever see it back? There were over 150 people sprinting during the conference. Two days long the room was packed and filled with computers running buildouts and people gathering around to have discussions on 20+ sprint topics. We would like to thank you all for all the compliments on twitter, the mailinglists, in person or in any other way. We enjoyed organizing this event for you and we have learned a lot from it. Have the talks separated by at least 5 minutes to make sure people can walk from one place to another so they don’t miss out on the beginning and the people giving the talk are less distracted by people walking in late. Lightning talks work better when given 3 to 4 minutes, not 7. Allow 1 hour in the program for lightning talks, not 45 minutes. 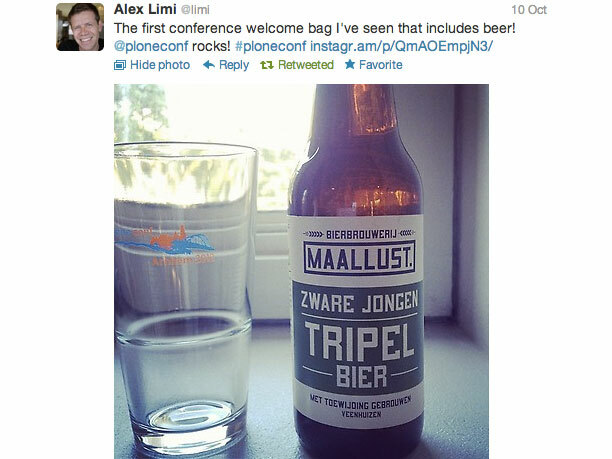 PloneConf 2012, one to remember!